ALMOST HEAVEN - Incredible view of Mt. Yonah, with large deck & Hot Tub! Only 6 miles from Helen, Ga.
Quiet & peaceful, you will relax in this 3 bedroom/3 bath cabin with a large back deck. Enjoy the Deck from the loft, living room & from the basement! Relax in the HUGE hot tub, just one step from the Master Bedroom. Enjoy the swing overlooking the view of the valley below. Enjoy a STUNNING view at the face of the famous Mt. Yonah from the comfort of any of the 3 stories of porches! Enjoy the panoramic views as you indulge in an array of porch swings & gliders. The sunrise here is spectacular leaving you feeling like it was ALMOST HEAVEN! A pool table, foosball table and 3 TVs are provide to keep you and your group entertained while you stay in the cabin. If you do venture out, you are only a short drive to Helen, Ga! Giving you easy access to tubing & the entire town of Helen, Ga. In addition to this all guests have access to our private trout pond.This cabin also has a fire pit to gather around. Purchase of Firewood is available for delivery upon request. 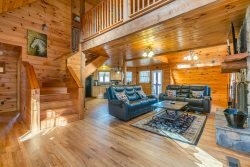 Whether you stay in the Cabin or choose to tour the Town of HELEN GA, you are sure to enjoy your stay in this LUXURY Custom Built Cabin. The road to this cabin is paved and only 0.4 miles from the main road. Sleeps: Up-to 6: Do not exceed 6 guests! Almost Heaven was wonderful. The views were exactly what we were looking for. The cabin had all of amenities we needed. We loved it and will be back!